The Hong Kong Academy for Performing Arts, established by Government Ordinance in 1984, is a leading tertiary institution in performing arts in Asia. It provides professional undergraduate education and practice-based postgraduate studies. 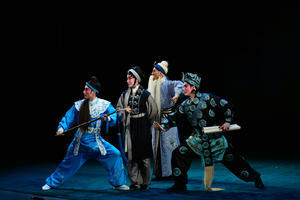 The study encompasses Chinese Opera, Dance, Drama, Film and Television, Music and Theatre and Entertainment Arts. Its educational philosophy reflects the cultural diversity of Hong Kong with emphasis on Chinese and western traditions, and interdisciplinary learning. The Academy awards bachelor honours degrees and master’s degrees that are accredited by the Hong Kong Council for Accreditation of Academic and Vocational Qualifications. Diploma and advanced diploma programmes are also offered in Chinese Opera, Dance and Music. Aside from the main campus in Wanchai, Béthanie, the site of the institution’s Landmark Heritage Campus in Pokfulam, has housed training facilities for the School of Film and Television since 2007.